The Bank of Canada has released its latest assessment of the financial system and has once again highlighted risk from mortgages. While the overall tone of the report is positive – “Our financial system continues to be resilient, and is being bolstered by stronger growth and job creation, but we need to continue to watch financial vulnerabilities closely,” said Governor Stephen S. Poloz – mortgages are a notable worry. The governor said that there has been a shift in mortgage activity with an improvement in the quality of new high-ratio mortgages (downpayment less than 20%) but an apparent rise in low-ratio loans being issued to highly indebted households. The BoC says that the tighter lending rules which come into force in just over a month are expected to mitigate that risk over time. The bank also expects the policy measures taken to cool the housing markets in the Greater Toronto Area and Greater Vancouver Area should begin to ease activity, noting that price increases are continuing to be driven by the growing economy and tight supply of homes. The once-hot real estate market cooled considerably in 2017, and with Guideline B20 on the horizon, all indications are that it will stay that way. It is expected that first-time homebuyers will bear the brunt of B20 more than anybody else, and according to Sherwood Mortgage Group’s president, that could result in a noticeable decline in market activity. Ontario’s Fair Housing Plan, introduced in April, slowed down the overactive market, which might have been necessary from a consumer standpoint, but it’s remained inert ever since. Contento says that, under the circumstances, things could have been worse. Mortgage Edge’s Owner, John Bargis, says they’ve had a strong year, even if conditions have been less than ideal. In particular, he noticed monoline lenders being muscled, however, he believes they’ll show resilience in the face of B20. “The year was really good,” said Bargis. “There was a redistribution of volume between lenders. We managed to still support our monoline lenders, although there was a noticeable shift in volume to balance sheet lenders. We also saw a more aggressive presence from the credit unions as well. Bargis thinks the government is trying to regulate more industries, and while he wouldn’t rule out further intervention into the mortgage industry in the near future, he hopes for more transparent consultations. The banks of mom and dad, however, aren’t getting any regulatory breaks, and Contento thinks they’ll be under even further strain before the year’s over. The share of Canada’s population that is not able to access acceptable housing has remained stable over the past decade. Data from CMHC and Statistics Canada reveals that 1.7 million Canadian households were in core housing need in 2016, amounting to 12.7%, around the same as in 2006. The need is higher in Ontario which accounts for all of the CMAs with the highest core housing except for Vancouver and Victoria. 1 in 7 of Ontario’s households were in core housing need last year, up 130,000 from 2011 with the share reaching 15.3%. In Toronto the rate in 2016 was 1 in 5 households. Vancouver’s share was 14.9% in 2016 although that was a decrease from 2011. Rising shelter costs have contributed to a rise in core housing need in all provinces with an increase except for Alberta according to census data. OSFI has announced steps to reduce risks in the uninsured mortgage space. Siddall pointed out that these measures apply only to the federally-regulated financial institutions. He is concerned about the increasing levels of riskier mortgage activity by non-federally-regulated financial institutions. The measures introduced by the federal government in October of last year to tighten insured mortgage lending qualifications mainly by stress-testing applicants at the 5-year posted mortgage rate, rather than the contract rate, has slowed insured mortgage lending volumes by 25%, which is in line with CMHC expectations. Average property selling prices have fallen commensurately as well. But with so much attention paid to the imprudent borrower, I think it is important to note that the vast majority of Canadians manage their finances in a responsible manner. For example, roughly 40% of homeowners are mortgage-free and one-third of all households are totally debt-free. Another 25% of households have less than $25,000 in debt, so 58% of Canadian households are nearly debt free. Hence, mortgage delinquency rates are extremely low. In addition, two-thirds of outstanding mortgages are fixed rate, which mitigates the risk of rising mortgage rates over the near term. So here we are in the lead-up to the January 1, 2018 implementation of the new OSFI B-20 regulations requiring that uninsured borrowers be stress-tested at a mortgage rate 200 basis points above the contract rate. It has been widely expected that home sales would jump before yearend in advance of the new ruling and indeed they have. Even so, activity remains well below peak levels earlier this year and prices continue to fall in the Greater Toronto Area (GTA) for the sixth consecutive month. 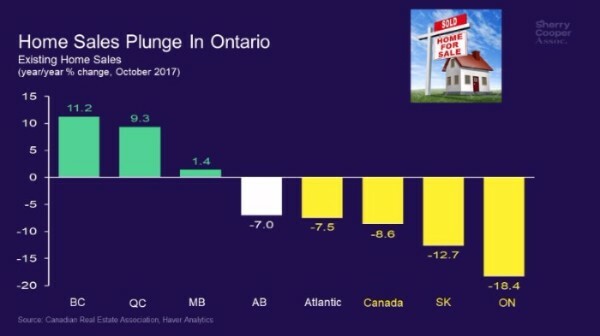 Indeed, national home sales were down 8.6% year-over-year in October, led by a whopping 18.4% plunge in Ontario (see chart below). Toronto single-family house prices were down 10.7% over the past six months ending October 31 (see chart below). GTA condo prices have fared better, up 2.6% since late April, but the rise is minuscule in comparison to the booming price gains evidenced before the Ontario government’s ‘Fair Housing Plan’ that introduced, among other things, a 15% tax on non-resident foreign purchases of homes. According to statistics released today by the Canadian Real Estate Association (CREA), national home sales rose 0.9% from September to October–the third such monthly uptick–but remained almost 11% below the record set in March. Activity in October was up from the previous month in about half of all local markets, led by the Greater Toronto Area (GTA) and the Fraser Valley, together with some housing markets in the Greater Golden Horseshoe region. On a year-over-year basis, sales were down 4.3% last month, extending the year-over-year declines to seven consecutive months. The decrease in sales from year-ago levels occurred in slightly more than half of all local markets, led overwhelmingly by the GTA and nearby cities. 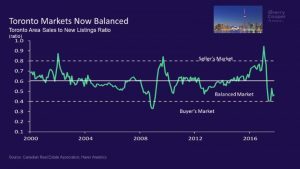 With sales up slightly and new listings having eased, the national sales-to-new listings ratio rose to 56.7% in October from 55.7% in September. 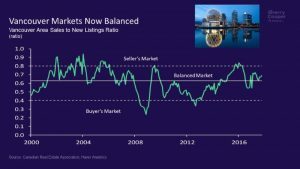 A national sales-to-new listings ratio of between 40% and 60% is consistent with a balanced national housing market, with readings below and above this range indicating buyers’ and sellers’ markets respectively. 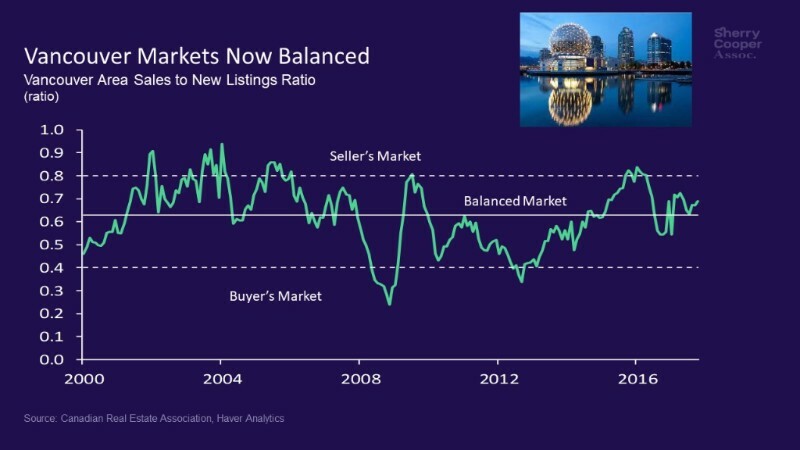 According to the sales-to-new listings measure, housing markets in both Toronto and Vancouver remain balanced. As the charts below show, the Toronto market shifted dramatically from a seller’s market following the April provincial housing measures. 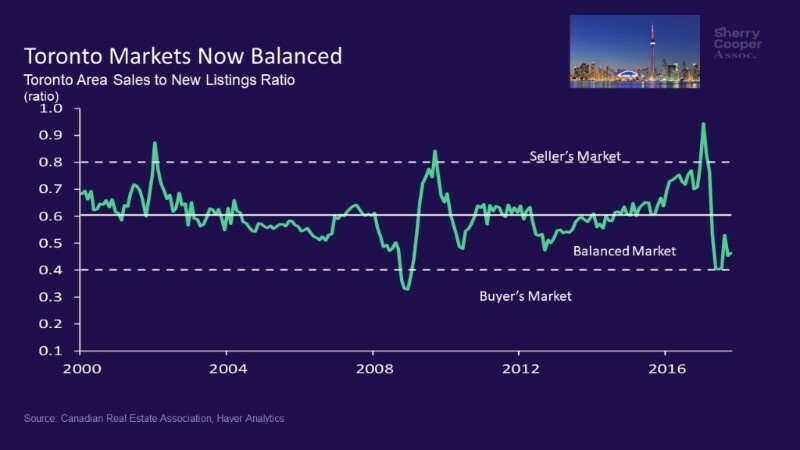 The number of months of inventory is another measure of the balance between housing market supply and demand, representing how long it would take to liquidate current stocks of unsold homes at the current rate of sales activity. There were five months of inventory on a national basis at the end of October, unchanged from the previous two months and roughly at par with the long-term average. In the Greater Golden Horseshoe region including and surrounding Toronto, the number of months of inventory was 2.5 months, up sharply from the all-time low of 0.8 months in February and March. However, it remains below the region’s long-term average of 3.1 months. Price appreciation continued to moderate year-over-year. 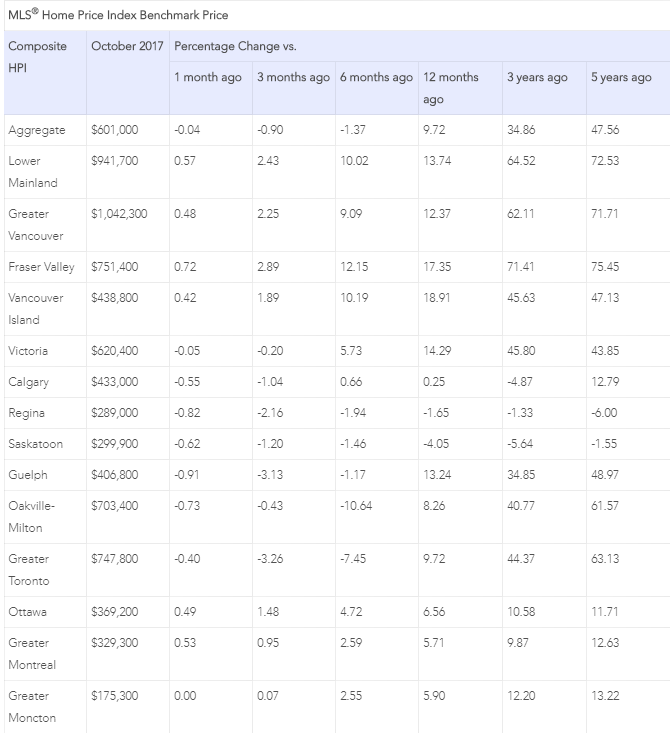 The Aggregate Composite MLS® Home Price Index (HPI) rose by 9.7% year-over-year (y-o-y) in October 2017, representing a further deceleration in y-o-y gains since April and the smallest increase since March 2016. The slowdown in price gains mainly reflects softening price trends in Greater Golden Horseshoe housing markets tracked by the index. Price appreciation was strongest in condos and weakest in single-family benchmark homes, which continues the trend in place since May 2017. 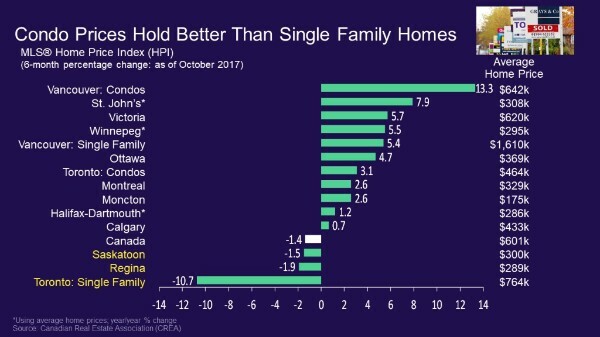 In October, apartment units again posted the most substantial y-o-y gains (+19.7%), followed by townhouse/row units (+13.2%), one-storey single family homes (+6.3%), and two-storey single family homes (+5.8%). The price appreciation in single-family homes was at its lowest level since March 2015. The Office of the Superintendent of Financial Institution’s new regulations governing underwriting practices — set to take effect at the beginning of next year — have been the source of much acrimony in the mortgage industry, and some are wondering if the federal government is deliberately sabotaging some lenders to benefit large banks. Two industry veterans echoed each other in stating that certain lenders, like mortgage finance companies, will not be able to keep their heads above water. Additionally, both not only questioned why credit card debt isn’t a topic of conversation if household debt is, indeed, reaching disquieting levels, but they both believe many first-time homebuyers will be precluded from entering the housing market. Before the latest regulation amendment, the Department of Finance updated lending practices in October 2016. While Strandlund-Noble agrees that housing prices in Vancouver and Toronto need to come down, she’s confounded by the government’s one-size-fits-all policy because she sees small cities and first-time buyers being pilfered. Atlantic Canada and the Prairie provinces are among large swaths in which she sees trouble brewing. But Mandel also blames the government for the astronomical cost of housing because they did precious little to solve the supply issue. Given the government’s immigration policy, he believes they exacerbated the supply problem by not ensuring enough inventory was available in the marketplace. “If you’re going to maintain a policy of steady immigration and bring in 300,000 people annually, most of whom will try to settle in the GTA, you need to deal with the supply of developable land and remove the red tape associated with change-of-use of existing lands so that builders and developers can readily convert or create infill projects to meet demand through higher density,” he said. This can create more urban sprawl —which would be at odds with growth plans — he added. Mandel ultimately believes lenders and consumers are getting fleeced by government policy that he says is convoluted enough to fly beneath the average Canadian’s radar. “The banks are going to win huge at the expense of the monolines, and what we see, ultimately, that nobody is talking about, is further concentration in the banking industry in Canada,” he said. “There’s no competition for them. Canada’s central bank is not worried that people will expect very low inflation to continue because it has repeatedly fallen short of the Bank of Canada’s 2% target, governor Stephen Poloz said on November 7. “As a central banker you always concern yourself with…the risk that expectations will gravitate towards the actual experience instead of to the target itself,” he told The Canadian Press after discussing inflation with a Montreal business audience. But he noted that there is no evidence of a “de-anchoring” of expectations, saying all of the bank’s surveys suggest a strong knowledge about the 2% target established 25 years ago following a period of high and volatile inflation and interest rates. While the bank has an inflation target range of between 1% and 3%, Poloz isn’t overly concerned if it dips below or rises above the midway point. He said many advanced economies have faced a similar trend. In a luncheon speech to CFA Montreal and the Montreal Council on Foreign Relations, Poloz said the fundamental drivers of supply and demand, as well as short-term factors, can explain the movement in prices and that the popular perception that inflation has become inexplicable is exaggerated. “In part this perception reflects a misunderstanding of the accuracy with which economists can predict inflation and a misunderstanding of the precision with which central banks can control it,” he told an audience of 1,000. Inflation in Canada slowed over the first half of this year and remained in the lower half of the Bank of Canada’s target range even as the economy grew quickly. The Bank of Canada is aiming to keep inflation at 2% by making changes to its key interest rate target. Poloz said it would take 18 to 24 months for a change in interest rate policy to have its full impact on inflation. In keeping the rate on hold last month, the Bank of Canada said less monetary policy stimulus will likely be required over time, but that it will be cautious in making future adjustments to the policy rate and be guided by the incoming economic data. “A lot of pieces need to fall into place before we can be certain that the economy has made it all the way home,” Poloz said. The expected slowdown in the Canadian labour market did not materialize in October as full-time jobs surged and wage gains accelerated. Total employment increased by 35,300 last month and the unemployment rate rose a tick to 6.3% as the labour force participation rate edged up a bit to 65.7%–well above the level in the U.S. Full-time jobs rose 88,700 while part-time jobs fell by 53,400–evidence of strong improvement in the quality of net-new job creation. Canada has added 201K full-time jobs in just the past two months, the strongest two-month performance on record (see chart below). This report might force the Bank of Canada to reconsider its view that there remains a lot of slack in the Canadian jobs market. Another sign of stellar growth was the 2.7% year-over-year gain in total hours worked and hourly earnings of permanent employees increased by a whopping 2.4% last month, the strongest annual wage growth since April 2016 (see the second chart below). The jobless rate has trended downward over the past year, falling 0.7 percentage points. While the overall unemployment rate was 6.3% last month, the jobless rate for prime workers–those aged 25- to 54-years old is much lower–posted at 5.1% for women and 5.6% for men. Men have been harder hit in both the U.S. and Canada as much of the restructuring in jobs has been in male-dominated industries such as heavy manufacturing (and construction in the U.S.) and most of the growth has been in female-dominated services such as health care-related services. Canadian employment rose in several industries, led by “other services” (which include services such as those related to civic and professional organizations, and personal and laundry services) up by 21,000. Construction jobs rose by 18,000 in October but were virtually unchanged on a year-over-year basis. Also strong were information, culture and recreation and agriculture. Employment declined in wholesale and retail trade. According to StatsCanada, the most significant employment gains were in Quebec, followed by Alberta, Manitoba, Newfoundland and Labrador, and New Brunswick. At the same time, there was a decline in Saskatchewan. 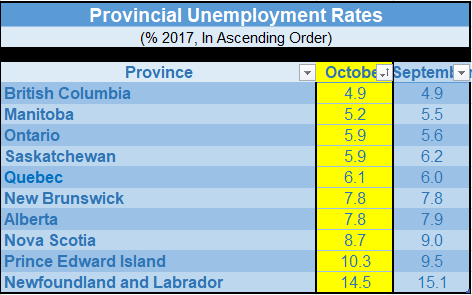 Unemployment rates by province are in the table below. October Payrolls Data in the U.S.
U.S. employers added 261,000 jobs in October, and the unemployment rate fell to 4.1% according to data released this morning by the Labor Department. As well, average hourly earnings rose 2.4% from a year earlier. Last month’s job gains mark the 85th straight month of U.S. job growth, the longest such streak on record, as the economy rebounded from the hurricane-induced slowdown in September. The policymakers at the U.S. central bank decided to leave the target range for the federal funds rate (equivalent to the Bank of Canada overnight rate) unchanged at 1 to 1-1/4 percent, acknowledging that the stance of monetary policy remains accommodative. This stance will allow the labour markets in the U.S., which are already very close to full employment, to continue to improve and return inflation, which has been below target, to a sustained level of 2 percent. Unlike the Bank of Canada that has the single objective of 2 percent inflation, the Federal Reserve has two objectives–to maximize employment and 2 percent inflation. Historical data suggests that these two objectives are typically at odds–the higher the level of employment, the higher the level of inflation– so the Fed has a balancing act. In recent history, however, inflation has remained well below target, despite the strong performance of the U.S. jobs market. The same is true in Canada. Inflation of goods and services has been held down by technological innovation, improved productivity and global competition. Wage and salary inflation is also quite muted, especially in Canada. As well, inflation expectations are well anchored at low levels. In consequence, the economy has been able to move closer to full employment than in the past without triggering inflation, which is good news. The policy-setting committee “expects that economic conditions will evolve in a manner that will warrant gradual increases in the federal funds rate; the federal funds rate is likely to remain, for some time, below levels that are expected to prevail in the longer run. However, the actual path of the federal funds rate will depend on the economic outlook as informed by incoming data”. So, more rate hikes are ahead, but rates will rise gradually. Also, the Fed continues to unwind quantitative easing by selling bonds from its portfolio. This “balance sheet normalization program” was initiated in October 2017 and “is proceeding”. Financial markets are interpreting the Fed’s statement as signaling that a December rate hike is on track, as the Fed acknowledged that: the economy is strong despite the hurricanes, the labour market has continued to strengthen, and it expects inflation to rise gradually. A December interest rate increase would be the third such move this year. The Fed has increased interest rates four times since late 2015, all of which happened at meetings that were accompanied by a press conference, which occurs at alternating meetings. There will be a press conference in December. Of great interest is President Donald Trump’s nominee for the head of the central bank, a decision he is expected to announce tomorrow. According to many media outlets, the president is leaning toward picking Fed Governor Jerome “Jay” Powell, although he has been considering other candidates including the incumbent, Janet Yellen, whom he called “excellent”. Powell, a Republican and former Treasury official, has supported Yellen’s policy of gradual rate increases, while calling for a modest rollback of post-crisis financial regulation. In more than 40 FOMC votes since becoming a governor in 2012, including this meeting, he has never dissented from the majority opinion.